It is common to hear people discussing the cost of health care today. But it is a whole different conversation when people are preparing for retirement. Often, those retiring suddenly realize that a significant portion of their retirement income will go directly to pay for health care. The luxury of being an active employee on our agency is that the entire amount of your coverage as an employee is paid for by the Department in a contractually negotiated amount, which is roughly $10,600 annually per employee. This amount results in zero contribution for a single employee with no dependents and a small contribution for dependent coverage for those with a spouse or family. The end result is that there is not a lot of thought or worry placed on the cost of health care during our working years. That all changes as you approach your retirement date and begin to plan for a fixed budget based on your PERS monthly benefit. Once you have left active service, you can elect to remain on the health plan, but the amount contributed on your behalf by the Department as an active now becomes your responsibility and is part of your monthly contribution as a retiree. Most people experience “sticker shock” when they discover the rate they will pay as a retiree, and that is not even the actual cost of the coverage. I have included the current rate schedules below to illustrate my point. We have not done a particularly good job at the Association in informing members of the important facts about health care as a negotiated benefit. First, exactly how much time and money goes into your health-care benefit and why is it so important? I have been a part of a few of our contract negotiations, and I have always been shocked at how singularly focused our members were on the COLA raises and some other ancillary benefits, all the while completely dismissing increases to health and welfare as part of the raise or benefits package in each contract. Many years ago, it was readily apparent that health-care costs were going to skyrocket and the aging population in our society, and our agency, was going to feel the brunt of it. Just to level set the value of retirement coverage with the Health and Welfare Trust as compared to what you can purchase on your own today, please see the rates below and pay close attention to the benefits themselves relative to the rates/package you get. This information is taken directly from the Nevada Individual Exchange and reflects a true rate for a family of five. 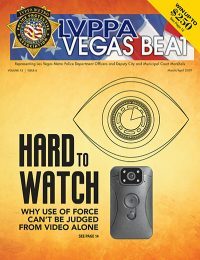 When looking at the information, keep in mind that the LVMPD EHWT includes medical, pharmacy, dental and vision coverage all within that rate. The other choices are medical- and pharmacy-only plans. That brings me to the second point of inadequate messaging on our behalf. For years, there was very little education, preparation and information disseminated about the importance of preparing for future health-care costs. On the positive side, this has changed. Currently, through the Association, the Department, the Health and Welfare Trust, PERS and many other information outlets, there is ample information and messaging to prepare you for managing your retirement and your health-care costs. Fortunately for many of us, there was some foresight in the creation of the Employee Benefit Trust, where we will receive a monthly benefit amount to help offset the costs created through our years of contributions and trust management. In closing, I wish each and every one of you a long, successful and healthy career. That being said, be smart and diligent in your planning and prepare yourself for the inevitability of health-care costs being one of the biggest cost obligations of your retirement, if not the largest. I urge you to attend at least one retirement seminar presented by the Association, or one through the Department, as these resources are available to you and give you the ability to learn and ask questions. Look for announcements regarding future dates and times for these events. 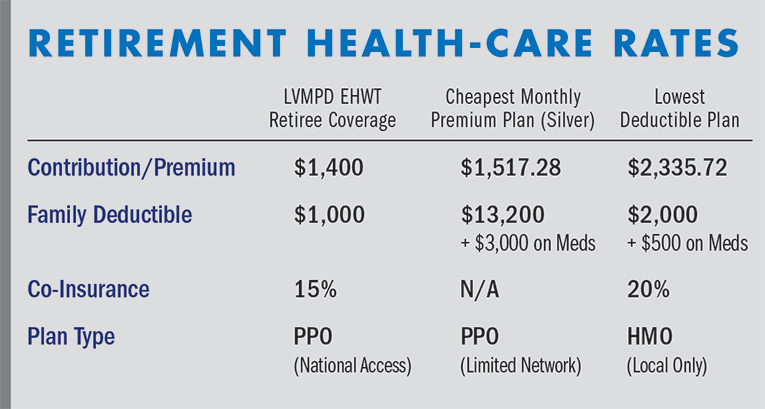 At the very least, reach out to our Health Plan Director Kelly Taylor at (702) 641-2160, and she can walk you through your options.